When it comes to your body, what should be your #1 focus to building the best meal for your body?? My guess is 50% of you are mumbling something about Calories, saying that the QUANTITY of food that you eat is the most important part of weight loss and maintenance. (Nodding head) Yes, yes very true and valid point. Then I’d venture to guess that the other 50% of you is saying something about the Macronutrient Breakdown or the QUALITY of your foods and how many grams of Carbohydrates, Fat, and Protein you are getting. (Raising hands in the air) also, not wrong there! Getting enough protein while not too many carbs and the right amount of healthy fat IS very important too. In this industry of Health and Fitness, you’ll visit a hundred sites focused on weight loss that will break down weight loss this way. I have lived the majority of my life focusing on one……then the other…… then both…… then neither! But, I’ve changed my focus and my priority now. I’ve realized, I have been living just to see results, but I have not been LIVING my best. I might be at a healthy weight, I might have pretty great muscle mass and a pretty lean figure. But my main issue for the last few years, especially as I age (and don’t worry, I fully admit I’m not even old yet!) is that no matter how healthy my weight and my body fat levels might be, it doesn’t mean my body is FEELING great. If I’m not feeling great, then I’m not living my best life and I’m certainly not living the life at my fullest potential the way God intended. I am happy to announce, that I have completely re-wired my mindset and approach to my health and to those of my clients. Instead of starting with calculations and macro nutrient distribution of meals plans, we start with the ENERGY components first and foremost! More appropriately, getting Nutrient Sufficiency from your food. Nutrient deficiency is the one factor that no matter how healthy of a weight you might be, no matter how much muscle mass you’re sporting, or how ripped and toned you are, if you are not getting enough nutrients in your body, then you are simply not living your life the way God intended! Life should be about thriving! About having energy without depending on things like caffeine or other stimulants to make it through the day. About having sustenance for your brain to function at it’s highest capacity; to have a healthy digestive system that moves quickly and excretes efficiently; to be sure that our immune systems are working at optimal levels to prevent illness and death; to know our systems are all working at peak conditions. The difference between living and thriving can be found in a Nutrient Focused meal plan! What’s great about living this way, is that it really is very simple to start! 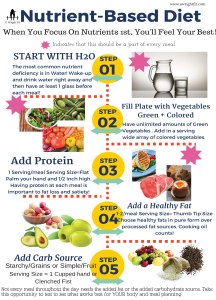 There are only 5 Steps to the Best Meal for your Body! Every meal can get you closer to Nutrient Sufficiency and feeling better every day! But first, let’s define what we’re talking about when I’m talking about NUTRIENTS. Vitamins and Minerals are incredibly important because they the delivery agents that actually carry out all functions in the body, including converting our food into energy!! One example) Muscles cannot contract unless the mineral Calcium binds in the muscles cell. That same muscle cannot relax unless Magnesium binds in the muscle cell. Kinda important, wouldn’t you say?! So, while it is easy to glance over Vitamins and Minerals and only focus on “weight loss” or “leaning out” but you’d be missing a HUGE, albeit, micro-sized problem! A problem that is all too common when we are just focusing on our BODY goals without fully embracing what it means to be Truly Healthy: Body, Mind and Spirit. Before you go reaching for your Gummy/Flintstone/WomanDailyChewable or any other version you get, be aware, that simply taking a multivitamin does not mean you are doing a service for your body. In fact, it could be quite deadly. Many studies have come out warning against the dangers of over supplementing with vitamins ad minerals. The article goes on to site 5 additional studies that showed that taking supplements of several different vitamins and minerals, notably Vitamin E, all were associated with higher rates of mortality. The article goes on to highlight one important fact about the FDA. Apparently we have not heard about these mortality rates from Vitamins and Minerals because of a botched court hearing and other political reasons. The Vitamin and Mineral companies certainly make a lot of money, and you can bet they enlisted the help of a congressman to help keep their empires in tact. I’d like to highlight here that we can all thank a politician named, William Proxmire, a Democratic senator from Wisconsin, for getting that bill to protect the Vitamin and Supplement industry banned in in congress back in 1976. Jerk. Moreover, it has recently been revealed that the industry of Supplements ARE NOT regulated by the Food and Drug Administration (FDA). So there is no telling if the labels are accurate, the quality is worth it, or the supplements we take are even what they say they are. Without knowing about all of those important factors, how can you justify the amount of money you are spending on taking them without really knowing if they are working for you or against you? The obvious first step in Nutrient Sufficiency that I emphatically practice and encourage is to make your priority getting enough nutrients and a wide variety of nutrients. 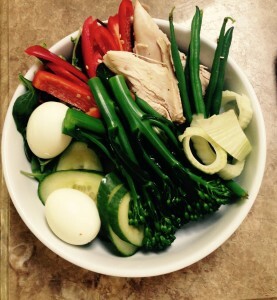 So every meal includes green vegetables, colored vegetables and water. I know, I know, I know. We are all so sick of people telling us to eat our vegetables!! But, honestly, in this day and age and in America, the land of plenty, there is such a wide variety of produce available to us, there is hardly any excuse that you can give me for not finding several vegetables in a wide array of colors that you can’t cook in a way to make them edible. You don’t have to love it…..but I can guarantee you can learn to like it. I know that we are America, and that we all think we have the right and need to LOVE everything that we do in life otherwise we just don’t do it. But, the reality is that we do a lot of things we don’t LOVE to do. But we do them because we must and because living is a responsibility. You know, like work. Jury duty. Wipe babies butts. Need I go on? Our bodies are sheer miracles. They are such blessings and we should all be in awe that God has designed us as he has! If anyone has any doubt in God, I dare you to take one human physiology class and tell me the complexity of our systems don’t make you believe in a Creator. Our bodies not only give us life and function and house our great minds and intelligence. But they are the vessel for which our souls carry out our Greater Purpose! As with all blessings from God, our bodies are our responsibility. It is vital to take care of them. They are our indeed our temples. Taking care of your body is our way of showing gratitude to God for the abundant life we live in our bodies. It shows how much you value and recognize the great gift He has given us. In spite of the pain, the hurt, the disease if might have. I still believe that you can find gratitude for what it CAN do and certainly how important it is! Eating well means you are showing your gratitude to God. Taking care of your body means you do not take it for granted. Loving our Body shows that you Love God. I encourage you to educate yourself on what you are eating and be more mindful of what goes in your mouth. It also means you might just have to eat some foods that you don’t LOVE. But doing so with a grateful heart will certainly make it taste better than you thought! Part of my calling and my goal is that I might help educate you, my beloved reader, on some of the very necessary and some less necessary Vitamins and Minerals out there and the ways that you can make your way to a more vivacious, energetic and grateful life! OH, and you might just lose weight while you’re at it too!! #bonus! First things first though, let’s make it easy on ourselves and just start with the basics. The Meal Plan design. Here’s my Inforgraphic to the 5 Steps to a Nutrient-Based Diet! Want the PDF version of this? Sign up for my newsletter HERE and you’ll get it sent right to your email! I LOVEDDDD this post! I am an avid vitamin taker (multi, biotin, fish oil, evening primrose and CLA). Glad these studies were brought to my attention. I read the NY Times article too. Very interesting. Can you do a post on health companies like Herballife, Body by Vi, Shakeology, Green Coffee Bean etc.? I have a lot of friends from my small town ask about these products as they see them as “quick fixes.” I try to convince them they’re not good, not natural and not an overall long-term solution to a healthy diet…I would love to share your post and knowledge with them so they finally get it! Thanks Anastacia!! I definitely admirer with you about your assessment in all of the trending supplement lines. I have had severa people try to get me to also sell them, but I never have because I am not a big advocate for supplements in general. One of the main reasons is because I know they are not regulated and therefore, I am unsure of the quality and actual affect on our bodies. I will follow up with some more research into each company and see if I might shed some more light for you. Overall, to me, your best bet is to cook whole, unprocessed food! It’s best in your body and on your wallet!